Well, here we go. Twenty-six posts in alphabetical order with Sailing as a theme. These are not textbook posts of the finer points of sail. Although that will be a post because I love the ridiculously true graphic describing them. This will be a combination of observations, tales of the Caribbean and an occasional explanation. We took up sailing about seven years ago. Theories to why abound – boredom, insanity, a desire to spend money on things like epoxy and rolling furlers and epoxy. What started as a 10 foot wooden bathtub has evolved into a 15 ft wooden sloop which was really just a gateway boat to a 24 foot, 40 year old rehab project. There is WAY too much Applied Physics in sailing. You CAN NOT travel in a straight line when traveling upwind. And of course, the converse of that, the restaurant you desperately want to have lunch at will ALWAYS be upwind. A Sailboat can't sail directly into the wind. If you turn the boat directly into the wind it will stop. This usually occurs as you are trying to maneuver out of the way of a large obstacle, say a cruise ship, or into a particular area such as your favorite lunch spot's only open slip or you are just trying to look cool in front of those irritating, hyper, power boats. Oh sure, a dead stop can come in handy when the wind whips up so strongly that parts of the boat are literally flying off around you and into Lake Monroe, Indiana. But generally, a dead stop is not what you want. note Sail M is closest and slightly raised, subSail J is the larger looking sail in the background. In order to maintain Force A of Wind Velocity W with Sail M as the variable, you must constantly reposition Sail M and subSail J, if subSail J is raised and the wind is not too great. 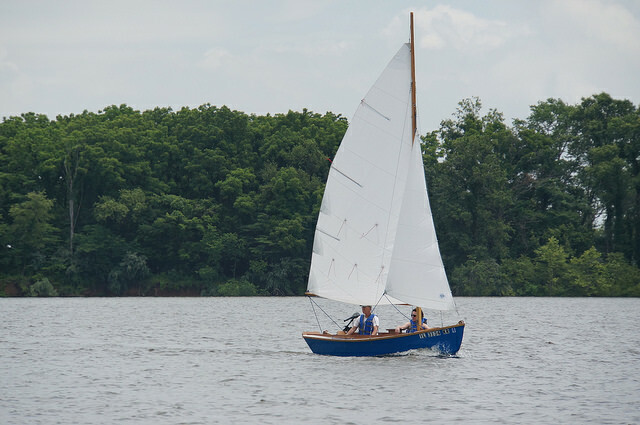 Or in non-math terms, you have to pick up enough speed in a cross-wind direction to allow release of the Front Sail (Jib) and moving the Big Sail (Main) through the wind to the other side of the boat, thus moving the boat in an opposite yet still forward direction at which time the Front Sail (Jib) is pulled back into place. If any of these things happens out of order the boat dies. As do your hopes of a refreshing rum-based beverage with lunch. Momentum is lost and all this manuvering must start again. 'About' is the last word you won't pay attention to as you sit in the cockpit with your fizzy water, attempting to get the perfect sailing selfie. Because if you aren't paying attention as the Captain yells 'I said Coming About!!' then Boom B will knock you out of the boat in into Lake L as the Big Sail (Main) swings into place, assuming you listened enough to let the Front Sail (Jib) out and didn't get too eager and pull it in too soon. There are two options when you hear the command Coming About. The simple one is to duck. The more complicated one is to grab the line which lets the Front Sail (Jib) out, causing much anxiety producing flapping which you will want to make stop by grabbing the other line and pulling it across to its new home. BUT DON'T! You must wait until the Big Sail (Main) has crossed the center line, along with the boom, before pulling the Front Sail (Jib) into its new, wind catching place, thus maintaining a somewhat drunken straight line to your lunch reservation. Oh, and those things I am calling 'lines' are called 'sheets' even though they are, in all actuality, 'rope'. There are a ridiculous number of names for every part of the boat with corresponding commands that sound nothing like what the intended purpose of those commands are. Your only hope of getting to that lunch spot in one dry piece is to learn at least the basic ones. Having a quick ducking reflex is also key. When all goes well, this is what you get, foreward-ish movement with a nice splash at the bow. This concludes day one of Alphabetical Sailing for the Easily Entertained. Or why can't you just say what time it is? Want to learn more or read some other entries? And ps - Happy Easter!! I feel like I'm going to know a lot more about sailing by the time we get to the end of April. Good fun and informative post. It is a lot of work, and possibly that is what the teenage portion of your son remembers. But as an adult, it is wonderful. Hopefully he will revisit the water one day. 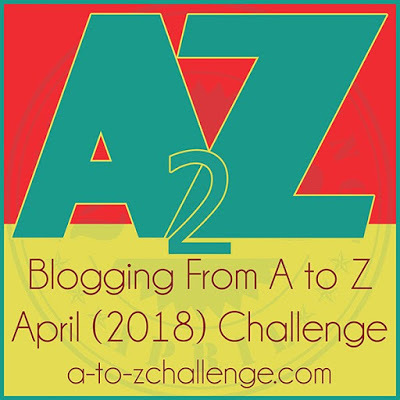 And thanks for the A to Z support! I have not been on a sailboat in decades but as soon as I read "Coming About!" I reflexively ducked. Yes, it may have been years ago but I've been on the losing end of that scenario enough times to have it deeply imprinted in my brain! And that is why you are still alive!! Lol!! I'm so NOT a sailor (or small boat person - give me a cruise ship) but I did share this post on Facebook with a couple of friends who are full-time sailing! Thanks for stopping by! And I would guess your son will know exactly what you mean! C is for Catamaran. Also Crazy. Buy a Swatch for Pete's Sake!